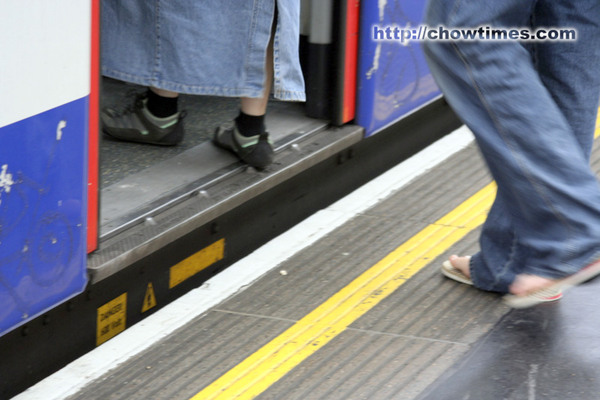 “Mind the gap, please” … “Mind the gap, please”. These words rings in my head everytime I took the tube in London. I have heard of this phrase being used before but not until I really see what the “gap” is like on the London Underground. I mean, it should not be too tough making sure that the train floor aligns to the platform but no, most station does not align at all. This gap above was not too bad. I have seen worse. There is a station where there is a six inch gap between the train and the platform. Anyone know why it is like that in the London Underground? 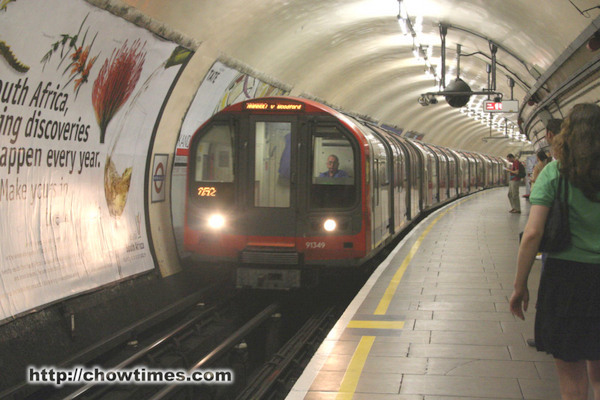 The London Underground is the oldest underground system in the world. It is also the longest in route length. It is amazing to learn that the first line was built way back in 1863 (not 1963!!). 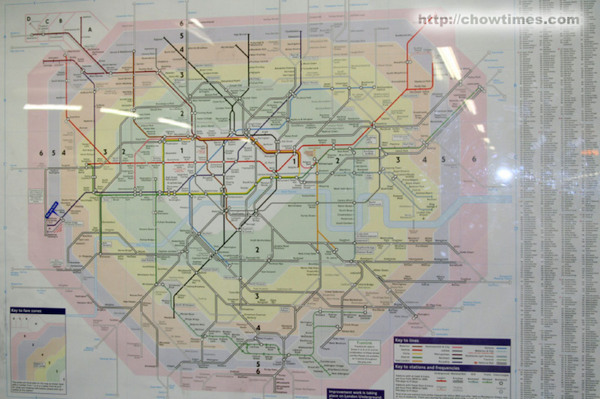 Below is the map of the London Underground. There are currently 275 stations in the entire network. It took a while for me to get used to it but once I get myself familiar, it was not too difficult. Despite its name, about 55% of the network is above ground. 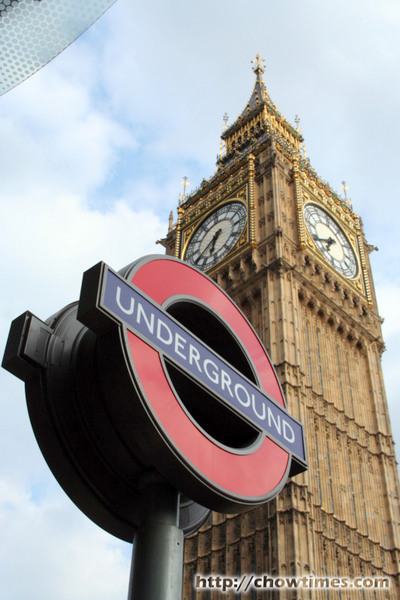 Popular local names include the Underground and, more familiarly, the Tube, in reference to the cylindrical shape of the system’s deep-bore tunnels. That is why you see that the top of the train were rounded. Towards the end of Day 2, I was really dead tired after all the walking. The jet lag is beginning to hit me. It’s feeling like I’ve been up the whole night. 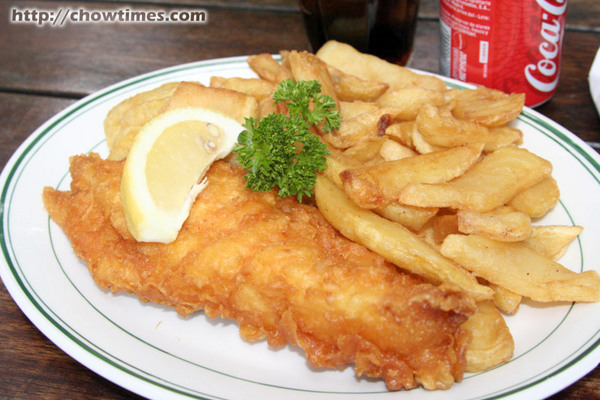 As tired as I was, I wanted so much to make my way to Covent Garden for Fish and Chips — not just any Fish and Chips but the original one. 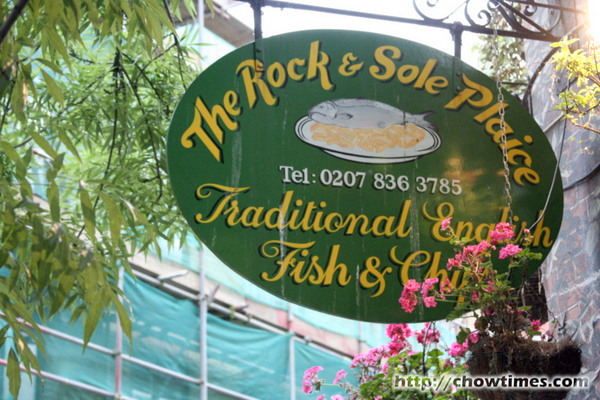 The Rock and Sole Plaice was established in 1871 and is possibly London’s Oldest fish and chips shop. 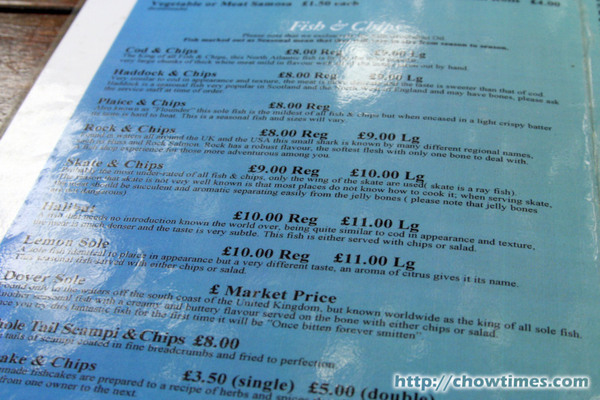 This shop does a steady stream of business at its takeaway and restaurant. Although it did not take me long to locate this place, it was not exactly easy to find. It’s on a rather quiet street away from the Covent Gardens Market. Despite the reputation, I must say service was awful! The blokes were busy watching football and I had to ask for service. Sheez! I took the seats outside the restaurant — low tables and bench for seats, kind of neat. Especially when my feet is so tired from all the walking, I felt so much like putting my feet up on the chair like a true-blue chinaman. The menu was simple enough but I couldn’t make out one type of fish from another. So, I guess that I won’t go wrong is I ordered the most expensive one on the menu — must have been the Halibut, I can’t remember. Well, it just so happen that they don’t have the Large one and offered me the regular one. I declined because I wanted something LARGE because I was very hungry. I ordered something else, can’t remember what now. 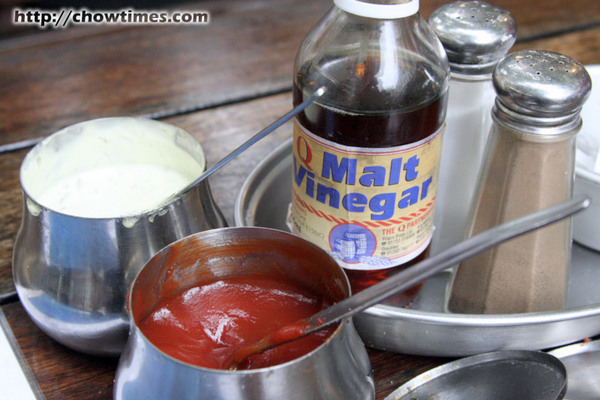 On every table is the condiments … tartar sauce, ketchup. and malt vinegar. I tried every one of them. I like the tartar sauce particularly. The large plate was indeed large. I was so glad it was that big. And the fries were thick. 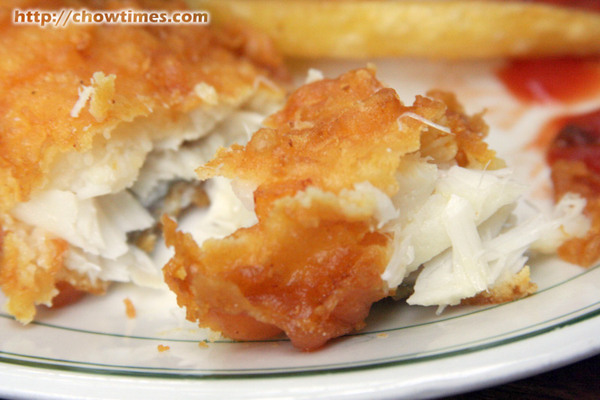 The meat was flaky between the crispy batter. I really enjoyed it and worth going out of the way for this. So, can you tell what fish I ordered? Was it cod? 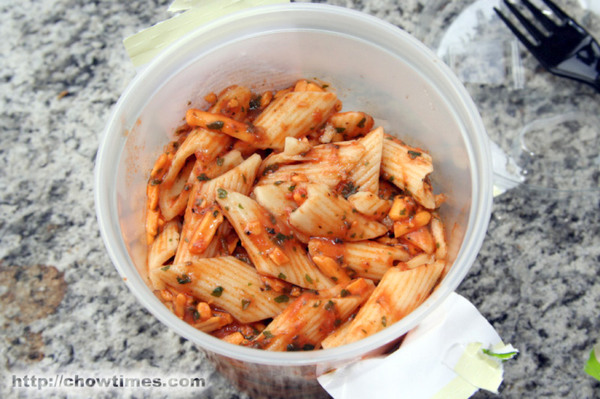 OK, this blog entry is not about food. It’s about more of my Sunday walking tour of the south bank of the Thames. 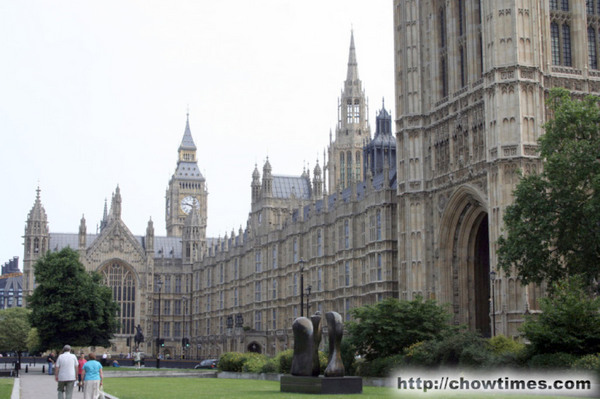 I started the morning hoping to visit the Westminster Abbey and the Parliament. 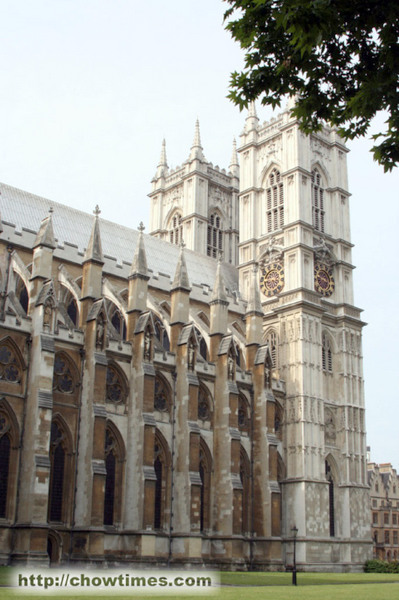 It appears that I chose a wrong day to that because Westminster Abbey is closed to tourist because of worship services. So, the best I could do was to walk around the compound. 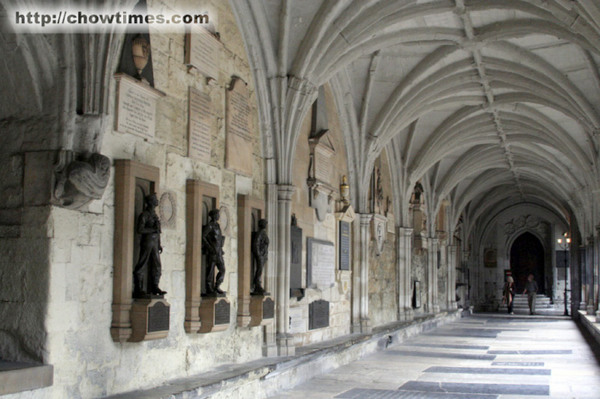 I found a small entrance at the back of the Westminster Abbey and got into the courtyard. It was really quite because not many people ventured to that back entrance. The corridor was amazing and mesmerizing reading the plaques on the walls and on the floor. Many of them are hundreds of years old. I had a good time reading some of them. The floor of the corridor seems like grave slabs. I am not sure really if people are really buried right under it but the writings appears do say so. The Parliament building’s public area was under renovation. So, I did not get the chance to see how the insides were. It was a long trip to London — exhausting, tiring but exciting at the same time. You see, I was in the historic city of London for a four-day company training and at the same time I had some work too which urgently require my attention. I did not have any time at all while in London updating the blog. However, Suanne did a marvelous job continuing to blog with a borrowed camera. I am going to catch up on the London Trip report over the next few days. One thing that really hit me hard in London was the sticker shock. I mean, although people did warned me how expensive London is, it really did not hit me until I actually had to pull the credit card out of the wallet. A buffet breakfast in the hotel I stayed in was 17 GBP! At the exchange rate of CAD$2.13, that breakfast costs a whopping CAD$35. It’s Sunday today and I could not rightfully expense breakfast to the company. So, I decided to just go to the city centre and try to get something cheaper. I travelled via the tube to the city centre (somehow, Londoners don’t call it downtown) and found a Tesco Express outlet. It’s very much like a 7-Eleven except that you see a lot of grab-and-go meals. 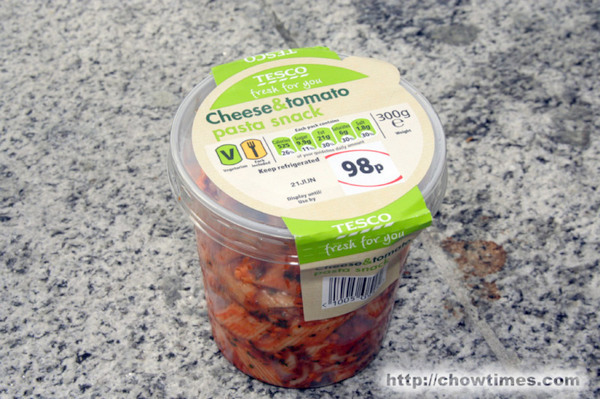 I grabbed the Cheese and Tomato Pasta Snack for 98p. 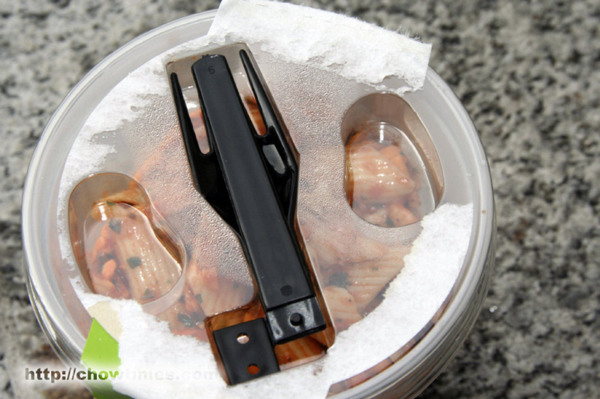 The snack included a folded fork on the lid. I know, it’s not much of a “breakfast” but it does fill the stomach for the morning. I left Vancouver for London on an Air Canada flight in late afternoon on Friday. Time wise, the flight was not too bad — it took about 9 hours in all and I did had a chance to sleep quite well. Grant told me I should have booked on British Airways. Grant was right, the Air Canada plane was a really old plane. The inflight movie was on a CRT TV. The seats although comfortable, has seen many. many years of service. Right after the flight took off, dinner were served. I was not given a choice at all unless you had special dietary requirements. The meal was chicken with potatoes and some vegetables. The chicken breast was pretty good. 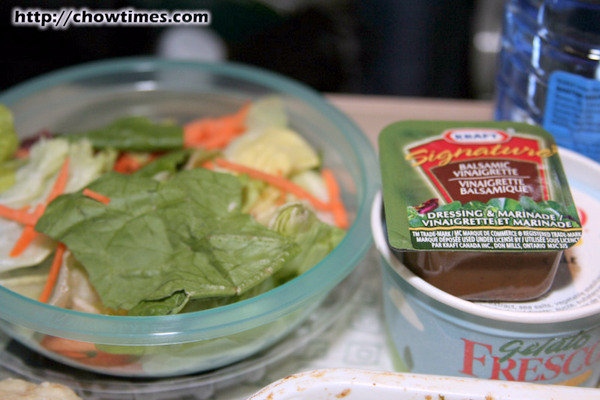 The meal also came with salad and Balsamic Vinegar for dressing. There were also a small tub of vanilla ice-cream. 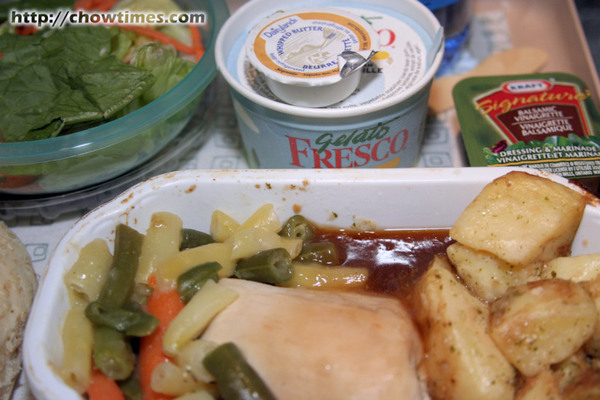 The meals were passable but I remember many years back, airline meals were a bigger deal. 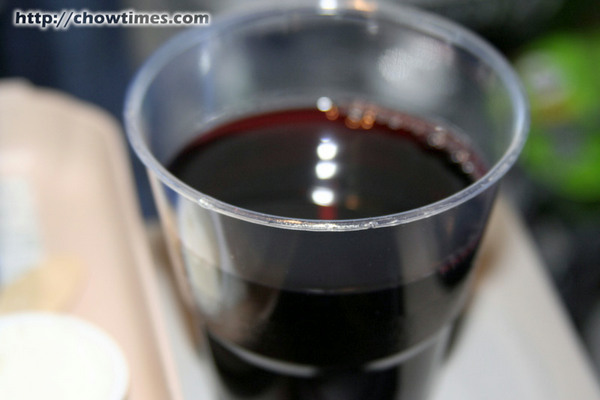 I choose red wine. It knocked me out right after — I wanted to sleep throughout the flight and it did the trick. About 1 1/2/ hour before landing, I was woken up by the announcement about breakfast. Breakfast was served in a simple box. 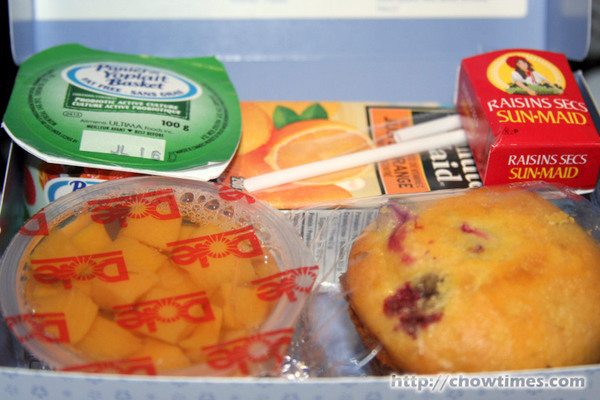 The box contained a muffin, peach, orange juice, yogurt and dried raisins. I also had coffee. I have never been to London before. Right after I checked into the hotel, I quickly made my way to the City on my own. I actually had a great time and seriously wished Suanne were here. I know she would have loved it here too. For this weekend’s lunch, we decided to finally go to the Han Ju Tofu Hot Pot. We have been saying that we want to try it for a long time but never gotten down to it. 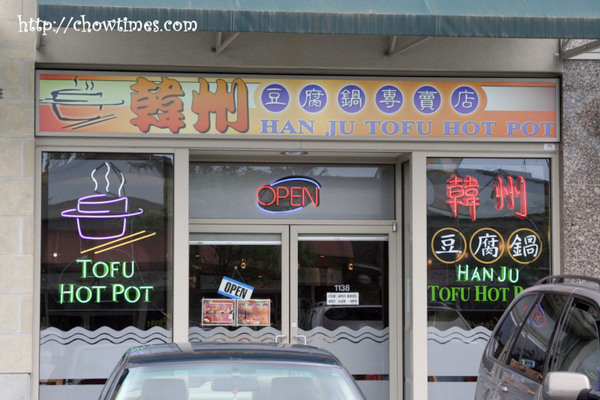 There are actually two Han Ju Tofu Hot Pot places. The original one was in Crystal Mall in Burnaby. They have opened in another location in Richmond the past few months. Lorna told us about this new location a few weeks back and so we decided to check that place out. The Han Ju is located at 8328 Capstan Way in Richmond. They are opened seven days a week, 11am to 9pm. It’s a small restaurant, just slightly larger than the cramped one on Burnaby. There are perhaps about 12 tables in all. 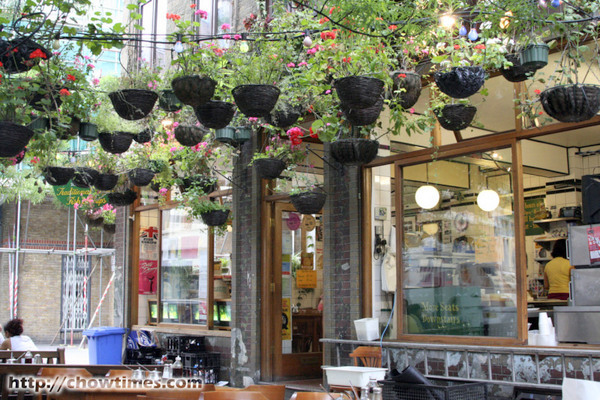 It is a very popular place and often you need to wait for a table — we had to wait about 5 minutes. Although this place is made out to be a Korean style restaurant, I think they are Taiwanese owned judging from the fact that they speak Taiwanese brand of chinese. Their signature dish is, of course, the Tofu Hot Pot. We ordered the Korean Style Kimchi Pot and asked that it be made spicy — you get an option on how spicy you want it. This dish is served with rice although the main staple is the green bean noodles in the soup. 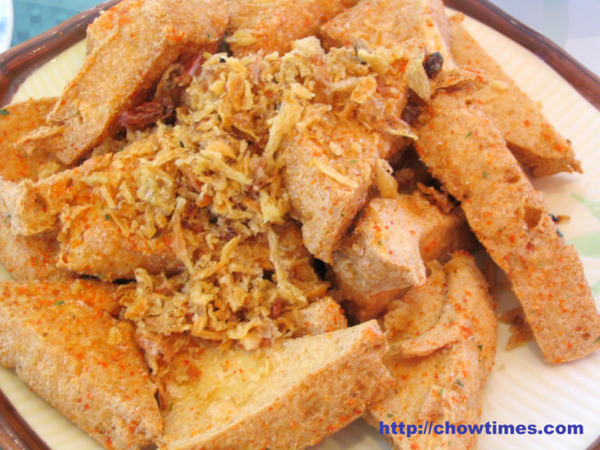 Other ingredients are Korean Kimchi, Mussels, Squid, Tofu, Sliced Pork and an egg. It’s quite a big serving, more than what I normally take for a meal. 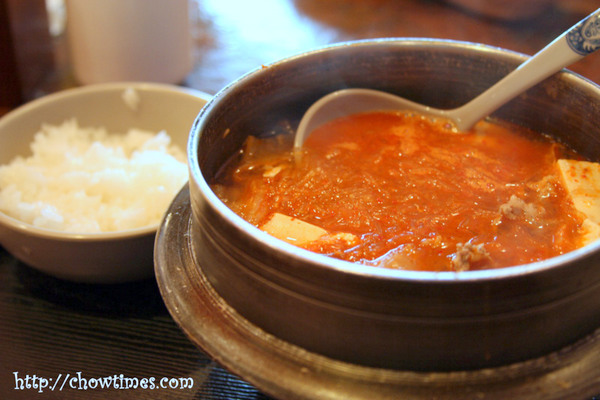 The dish is served in a metal hot pot — gotta be careful handling it because it’s very, very hot. This dish costs $5.95. Andy Lai and family from Portland visited Vancouver this week. Andy was Ben’s primary and secondary school mates. They only found each other back last year through the wonder of internet. Andy and Ben has not met one another for more than 25 years. It was very unfortunate for Ben as he was in London this week and unable to meet up with Andy. Nevertheless, Andy met up with me and the kids while they were in Richmond on Wednesday. We went shopping at Parker Place and Aberdeen Centre. Andy and family love to come to Vancouver for shopping and food. According to Andy, there is not many Chinese restaurants in Portland. Andy will go all the way to look for good food. 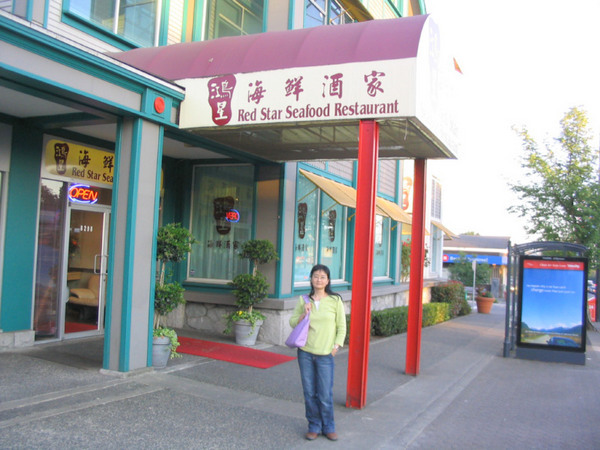 After a day of shopping, we went to Red Star Seafood Restaurant on Granville St and West 67th Avenue for dinner. Andy’s friends, Tom and Marina recommended this restaurant. Andy and Tom ordered a lot of dishes that evening. Here are some of the dishes they ordered. 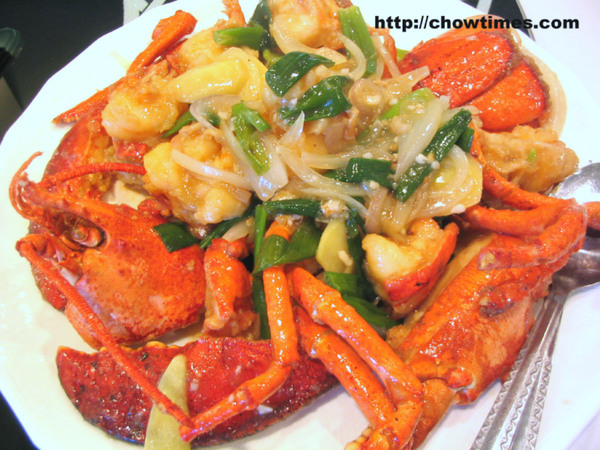 Lobsters stir fried in ginger and green onions. Jenny, who is Panos mom (and Panos is Arkensen’s best friend) had agreed to show me how to make a Greek dish a few months ago. Jenny was very busy and only until now she has the time to show me. Jenny is a Canadian and her husband is Greek. 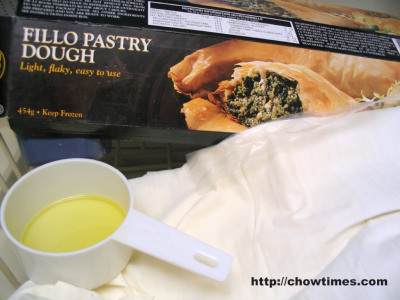 Jenny lived in Greece during her early marriage and she learned to make Greek dishes during her stay there. 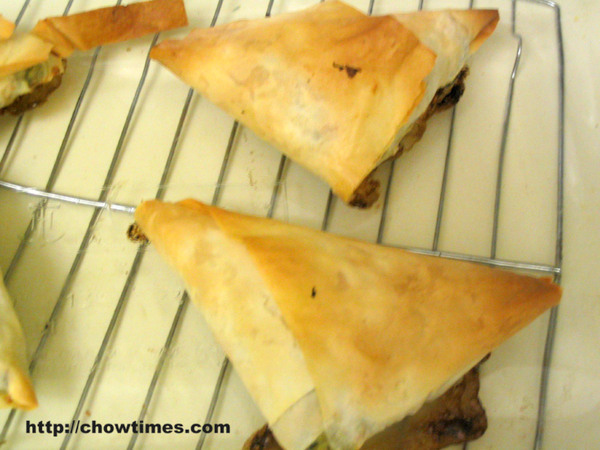 The dish which Jenny showed me is called Spanakotyropita, The word Spanakotyropita comes from the Greek word spanaki (spinach); tiri (cheese); and pita which is a hand held snack. Other pitas which you may be familiar with are the round cooked dough type typically filled with cooked meat, onions, tomatoes and a dab of tzatziki and are often served at Greek festivals or tavernas. one large cooking onion or 1 leek, rough chopped and sauteed or 1 bunch of fresh green onions which can be added directly to the spinach. The Gilmore Church Community Kitchen decided to have a break on the last session of this season before the break for summer holiday. Instead of the regular cooking class, the group went for dim sum at Empire Seafood Restaurant. 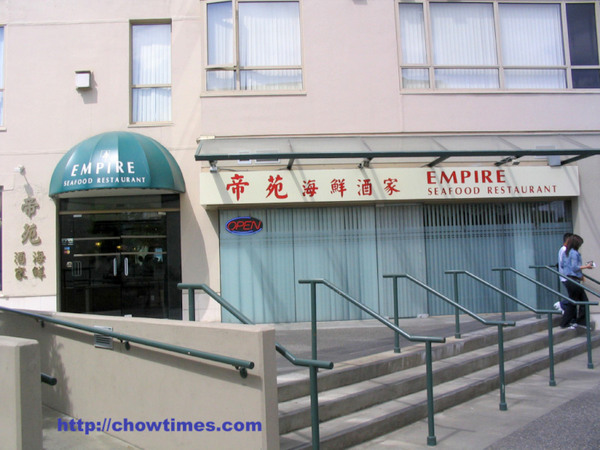 Empire Seafood Restaurant is located next to London Drugs on No. 3 Rd and Westminster Highway. This restaurant offers 20% discount if you place your order before 11:00 am. 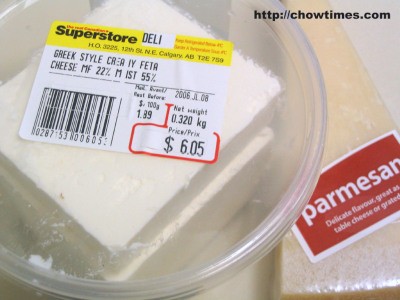 There are daily specials on discounted price. The restaurant has a menu of 82 items and the price ranges from $2.45 on daily specials to $7.85 per dish. I must say that it is not cheap. 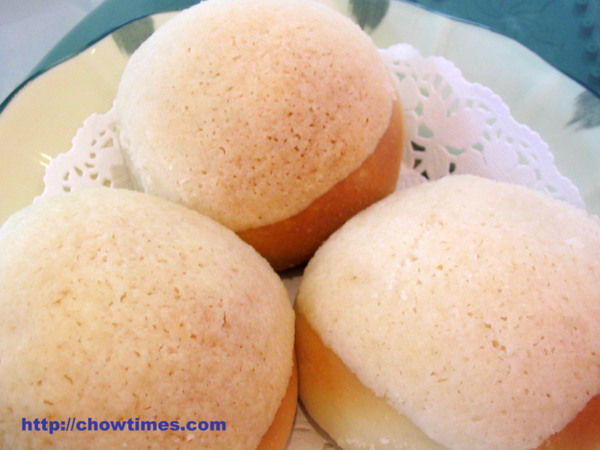 This is Empire’s specialty dish; baked BBQ pork buns. Regular price is $3.95 but it’s on special today @ $2.45. 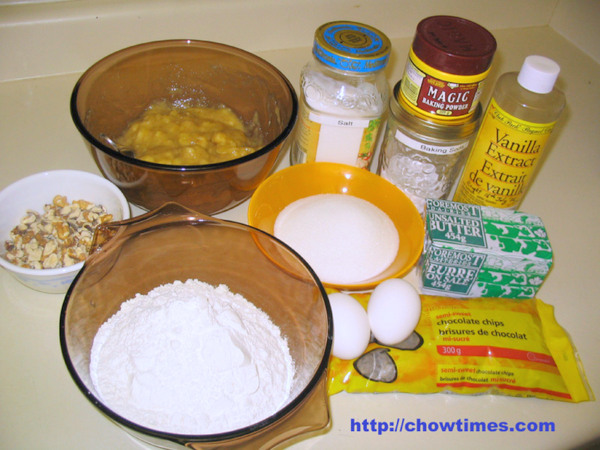 Out of the blue, I just wanted to bake a quick bread for breakfast. 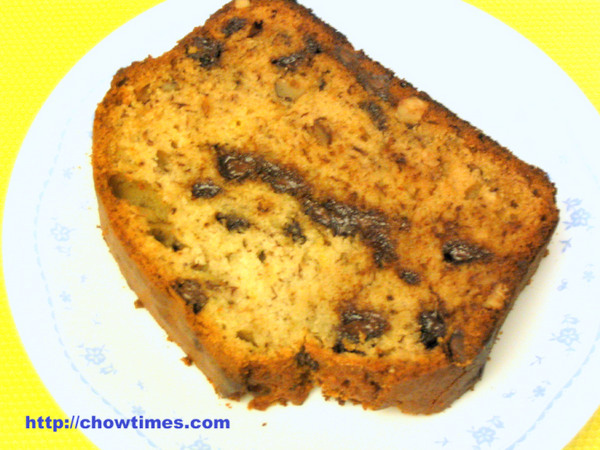 Looking through my recipe file for something which my kids will eat, I found this Chocolate Chip Banana Bread which sounds delicious. I just happen to have some ripe bananas in my fridge and it must be lucky day. Click link below for the instructions.